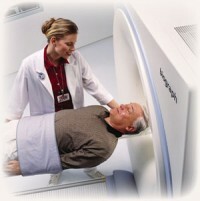 PET-CT is used to help diagnose cancers, cardiac diseases, and neurological disorders, the positron emission tomography-computed tomography, or PET-CT, combines the power of Positron Emission Tomography or PET scanning, with diagnostic CT imaging to create a single image which offers both functional and anatomic information. This device is used to diagnose and stage various cancers, and to pinpoint the most effective therapy plan for each patient. Besides PET-CT’s ability to diagnose and stage cancers, the system is also used to perform perfusion and viability scans of the heart, and advanced neurological imaging. Accurate registration of functional (PET) and anatomic (CT) patient images. Improved treatment planning for therapy. Shorter overall PET exam time (more comfortable for the patient). The following are just a few reasons you might want to consider having a PET-CT performed at California Imaging Institute. Detect the presence of coronary artery disease (CAD). Assess the extent of damage from heart disease. Localize seizure focus in patients with seizure disorders. Differentiate Alzheimer’s disease from multi-infract dementia or depression. Evaluate the extent of stroke and recovery following therapy. Detect recurrent tumors before they can be seen on CT or other imaging modalities. Determine if a tumor has metastasized.